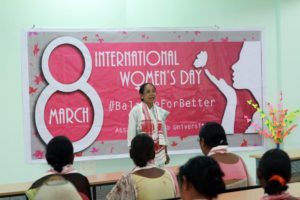 International Women’s Day celebration was organized by the Department of Social Work and Centre for Development Studies and Initiative at Assam Don Bosco University, Tepesia Campus. The programme, organized as a thanksgiving and appreciation of local women who work in the University’s garden, housekeeping etc also included a skit on ‘Cancer awareness- marking the role of alcohol in cancer’ performed by volunteers from North Eastern Cancer Institute. After felicitating 29 women who attended the programme with traditional gamucha, Fr. Stephen Mavely, the Vice Chancellor expressed his sincere appreciation for their contribution saying, “The first thing any visitor of the campus notice is how beautiful, clean and well maintained the campus is and that is because of your hardwork, love and care. As the University grows and moves forward, we want to take you with us. We are here for you and to lend helping hands whenever you need. As we grow, you too will grow”. ‘Diya Diya’- a video on violence against women was shown to help them realize the importance od knowing their rights and also to have the strength to stand up to such an abuse. 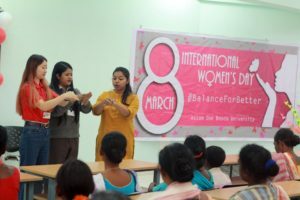 The video also encouraged to save a girl child and portrayed girls excelling in various field – such as social, cultural, economic and political. The programme concluded with a session “Women’s Adda – Women’s health and hygiene” facilitated by Ms. Bibharani Swargiary, Assistant Professor, Dept. 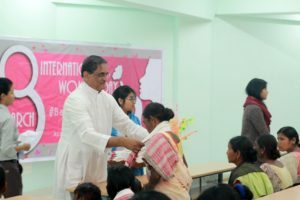 of Social Work, who also showed the procedure of making sanitary cotton pads at home. The Department of Social Work and CDSI are grateful to Barfu Nazary and Jiusa Narzary for contributing the gamucha from their piggybank and Ms Hazel Wahlang for the refreshments.